Always up-beat and “can do”, it was a joy to see Debbie’s smile on the many occasions she visited us. We always looked forward to seeing her. 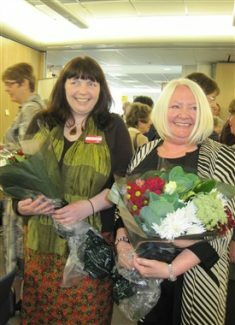 Debbie was the rock on which the Archive was founded as without her (and Sue Hampson) coming to us from the Essex Record Office and Essex LIbraries, we could not have started up. We wouldn’t even have had any chairs to sit on without Debbie ferreting around to find some for us. Debbie visited us in Hadleigh, offered us a chance to exist and lit the flame among our community which grew into the Archive. Debbie’s inspiration was infectious and gave us the confidence we needed to reach our launch. Debbie even managed to attend our launch on the Saturday when she was due to start a family holiday. Debbie’s presence on that day was so important to us. Debbie made everything easy with her lovely cheery demeanour, her enthusiasm, her integrity, her work ethic, her inspiration and her smile. Debbie made all of us at the Archive feel special because of the interest she showed in us. We felt that she was truly our friend. She seemed to enjoy this part of her job and her expertise and knowledge were major factors in the setting up of the Archive. The Hadleigh & Thundersley Community Archive will be forever in your debt. This archive is part of your legacy to history and the local community and you will be forever part of the story of our archive. What I loved about Debbie was her “magic bag” from which she would pull extension leads, tablecloths, spare batteries and all manner of paraphernalia to be used at exhibitions! Will be sadly missed. Debbie touched many lives and will be greatly missed.